The ubiquitin-proteasome system orchestrates cellular processes such as proliferation, survival, and cell death by selectively degrading key regulatory proteins and damaged proteins. Malfunctions in proteasomal degradation are linked to the pathogenesis of several age-related diseases such as neurodegenerative disorders and various types of cancer. Our goals are to understand how proteasome activity is regulated in an animal and how malfunctions in this protein degradation system contribute to age-related pathologies. We are investigating how proteasome activity is regulated over the lifespan of an animal and how this activity can be modified by genetic factors and environmental conditions. 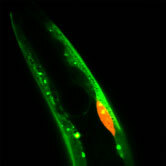 We use the nematode C. elegans as our primary model system to study proteasome activity at the level of the organism, in specific tissues, and in individual cells in a living animal. 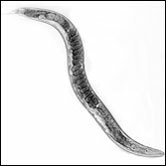 In addition to its simplicity at the anatomical level, short lifespan and transparent body, C. elegans provides a powerful tool for genetic analysis and genome-wide RNA interference screening. 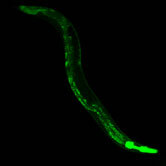 Due to conserved genes and signaling pathways, C. elegans has proven to be an excellent model system for human diseases. Our research is supported by funding from the Academy of Finland, International Human Frontier Science Program Organization, the Sigrid Jusélius Foundation, Medicinska understödsföreningen liv och hälsa r.f., and University of Helsinki. Copyright © 2003 University of Helsinki. All rights reserved.